This poster can be purchased Linen Backed or not, your price will be calculated accordingly. If you choose Linen Backed (recommended), then the time frame for Linen Backing is 2-3 weeks prior to shipping. Thanks! This is a Modern period New Wave style French advertising poster created by Bernard Villemot for Bally in 1982. 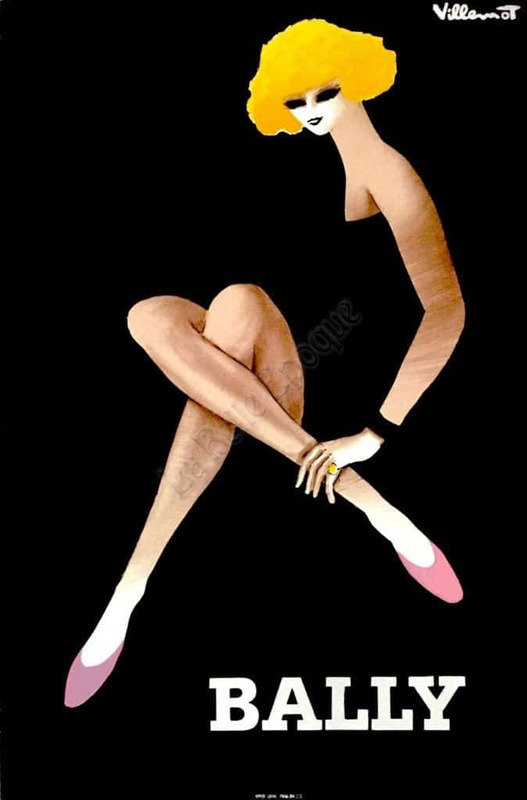 This iconic image shows a woman with bright blonde hair and long Matisse-inspired legs, wearing pink shoes engulfed by the bold black of the background. The white, simple typography on the bottom right of the image perfectly completes this archetypal New Wave style French advertising poster. This poster strongly features bright blocks of colors and simple lines, and it perfectly incapsulates modern French sophistication and style. The French graphic artist Bernard Villemot won multiple awards for his posters, and his work has been featured in retrospective exhibitions at the Musee des Arts Decoratifs and the Bibliotheque Nationale in Paris. This poster was printed by IPA Paris, 1982.